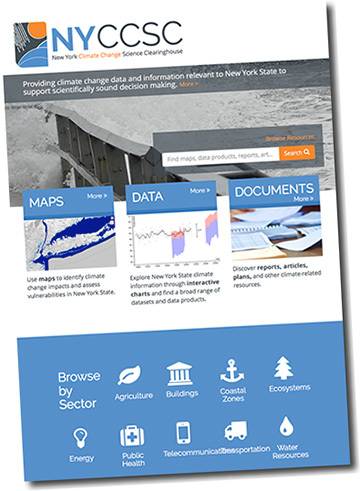 The New York State Energy Research and Development Authority (NYSERDA) has announced the launch of a new web-based information source for climate-related information developed by New York state in partnership with federal, university and public-private organizations. The New York Climate Change Science Clearinghouse has aggregated links to extensive climate-related information that can help prioritize future community and conservation planning efforts in the state. ESF is part of the project through the work of Dr. Colin Beier, as associate professor of ecology in the Department of Forest and Natural Resources Management. "As the nation's oldest institution dedicated to the science and stewardship of the environment, ESF is proud to have led the development of the Clearinghouse's interactive map viewer, and to have contributed overall to this important effort to enhance New York's climate resilience, led by NYSERDA," Beier said. New York State Chairman of Energy and Finance Richard Kauffman said, "Governor Cuomo has made it a priority to prepare New York for climate change and increase the use of clean energy as we move forward. The Clearinghouse provides information on how decision-makers can incorporate clean energy and resiliency strategies into their planning so we can meet the state's Clean Energy Standard and, at the same time, better meet the challenges of climate change." NYSERDA President and CEO John B. Rhodes said, "The effects of climate change are already affecting New York state's residents, businesses and environment. I thank the dozens of organizations that have contributed vital information to the Clearinghouse to help New York better prepare for the future." The Clearinghouse is a one-stop resource providing access to more than 1,000 maps, data sets and documents that show the impacts of climate change on infrastructure, transportation, energy, water resources, ecosystems, agriculture and public health. The site also provides information on greenhouse gas reduction strategies and how to incorporate clean energy into future decisions, a core component of the Governor's Reforming the Energy Vision strategy to build a clean, resilient and affordable energy system. The Climate Change Science Clearinghouse web-based tool was developed by NYSERDA, the Northeast States for Coordinated Air Use Management (NESCAUM), Cornell University, ESF and the federal National Oceanic and Atmospheric Administration (NOAA). Dozens of local, state and federal agencies, as well as agencies from other northeastern states, not-for-profits and community organizations also contributed to this project. The website is being hosted by Cornell University. NYSERDA provided support for the Clearinghouse through the Regional Greenhouse Gas Initiative. Arthur T. DeGaetano, director of the Northeast Regional Climate Center at Cornell University, said, "Providing relevant up-to-date climate data, documents and map-based climate products to New York citizens, policy-makers and businesses is essential to making New York communities resilient to both present day and future climate conditions and a key component of Cornell's Land Grant mission." Arthur Marin, executive director of NESCAUM, said, "For many years federal, state and local officials have highlighted the need for a comprehensive collection of information and tools to assist their efforts to develop effective strategies for adapting to climate change. With the release of the Clearinghouse, practitioners in New York state now have a powerful and easy-to-use tool to help them quickly identify, access, manipulate and visualize the data and maps needed to support their work. This product is the most comprehensive and user-friendly website of its kind and provides a key resource to state and local planners as they undertake the challenge of building a more resilient New York." Ellen L. Mecray, Regional Climate Services director, Eastern Region, NOAA said, "The New York Clearinghouse is an exciting investment from NYSERDA. New York is leading the way in the Northeast region with the introduction of this state-scale compilation of climate-related information. There is something in this tool for all of the major sectoral areas interested in planning for greater resilience in the face of a changing climate."